Drink Kind: Mineral Water, Pure Water, Fruit Juice, Wine and other no-gas liquid. 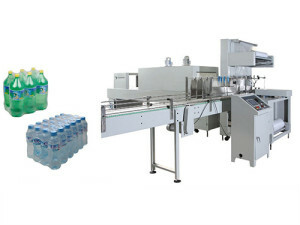 Preform automatic loading by the preform unscrambler, after heating it will blowing into plastic bottle by the blow molding machine,and send out to the air conveyor system of the 3-in-1 filling machine which collect washing bottle,filling pure water into bottle and capping the bottle, the product is driven by transmission motor. Sleeve labeling machine will automatic put the PVC label in the right place of the bottle water and shrinking by the shrink tunnel, Wrap shrink packing machine will finished the last step which use PE film to packaging 6/12/24 bottles water into one packaging and will convenient for customer to carry. Heating the preform, then blowing the preform into plastic bottle according the bottle mold. Removed all item of raw water like suspended solids, bacteria, algae, viruses, fungi,iron,manganese and sulphur, and else. Washing the plastic bottle, filler purified water into bottle and then capper. NEP-4000BPH Auto Water Bottling line is favorite love by most of our customer. It has advantages, such as high automation level, compact structure, beautiful appearance, convenient and simple operation, safe and reliable and adjustable continuous production capacity and others. It is mainly suitable for bottling of round or square polyester bottles. According to the demands of different specifications of users, it is only changed a little in design to meet the user’s demands.